The Archimedean solids are the 13 convex semi-regular polyhedra, excluding the infinite set of prisms and antiprisms. Each one has regular faces, but not all the same, and all the vertices are of the same type, that is they share the same relationship to the polyhedron as a whole. The duals of these models are called the Catalan solids. Each of these models was made from a single net generated by Great Stella, but could also be made using Stella4D or Small Stella. 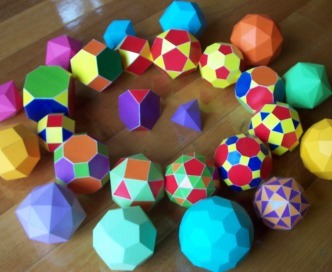 The nets for the Archimedean solids were printed onto white paper with a colour printer, with Stella filling in the desired colours on each face. Click on the images below to see a bigger picture and get more information about them.